Old West Stories in Newspapers: Here Comes the Morning Stagecoach! Maybe it was because of Father’s Day, but there were a lot of old western movies on TV this past weekend. Good ones, too, starring Gregory Peck, John Wayne, and more. 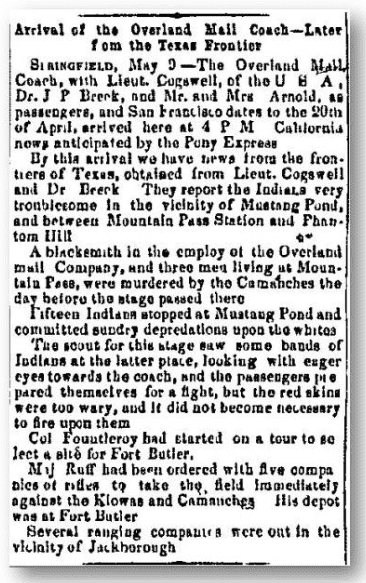 So, it was no surprise when I was combing through GenealogyBank today that I found this great newspaper article about an old western stagecoach, published in the Daily Ohio Statesman (Columbus, Ohio), 10 May 1860, page 3. It read like the plot of a TV western—only these stories of the old Wild West were real. “A blacksmith in the employ of the Overland Mail Company, and three men living at Mountain Pass, were murdered by the Comanches the day before the stage passed there. “Fifteen Indians stopped at Mustang Pond and committed sundry depredations upon the whites. “The scout for this stage saw some bands of Indians at the latter place, looking with eager eyes towards the coach, and the passengers prepared themselves for a fight, but the red skins were too wary, and it did not become necessary to fire upon them. “Col. Fountleroy had started on a tour to select a site for Fort Butler. “Maj. Ruff had been ordered with five companies of rifles to take the field immediately against the Kiowa and Comanches. His depot was at Fort Butler. Clearly, riding a stagecoach in the Wild West was just as dangerous as western movies later portrayed it! Every stop was an adventure. This old Pony Express Route, April 3, 1860 – October 24, 1861 map (courtesy, Library of Congress) shows the overland route many travelers took from Missouri to California. The strength of historical newspapers is that they provide a daily record of the past. GenealogyBank has the largest online newspaper archive, full of details about our American heritage. You can find stagecoach passenger lists, information about the early American pioneers and Native Americans and so much more in GenealogyBank. Carefully review GenealogyBank’s 1.2 billion records for the details of your family’s history. GenealogyBank Has Tomorrow’s Obituaries Today! Where's Duke Wayne when you need him?